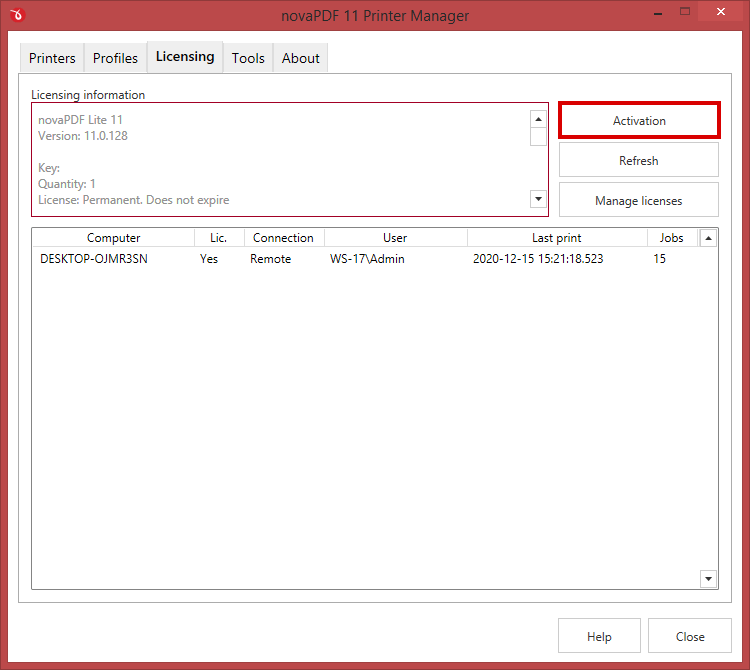 The deactivation in novaPDF has to be done if you want to move the novaPDF license to another computer or if your computer crashed and you want to activate novaPDF on another computer. 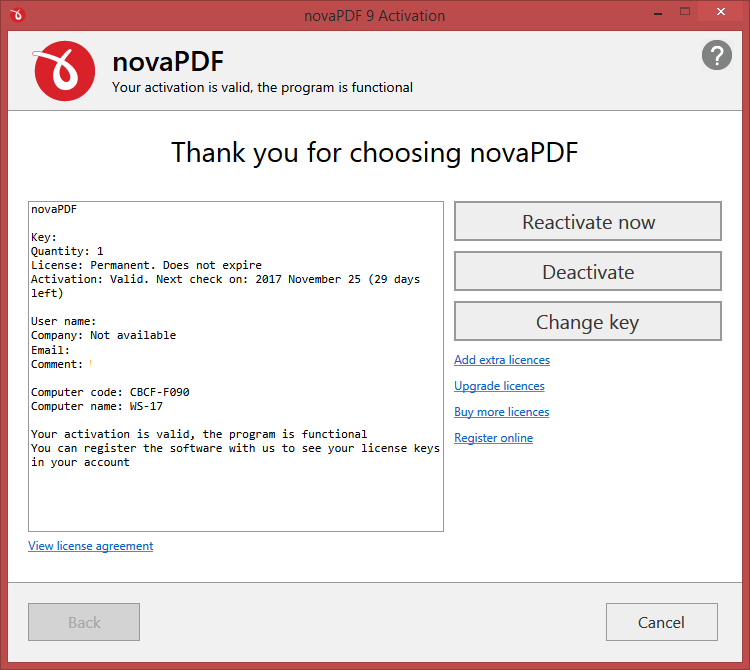 novaPDF has to be deactivated if you want to move the novaPDF license to another computer or if your computer crashed and you want to re-activate novaPDF. To deactivate the novaPDF license for a computer, you'll need to open the Activation window. Go to Start and type in novaPDF Printer Manager. Once that window is opened, go to the Licensing tab. To deactivate the application, click on the Deactivate button. After that is pressed, a confirmation window will ask if you really want to deactivate that key. Click Yes. If the deactivation is successful, you will receive a confirmation message. To deactivate the novaPDF license for a computer that doesn't have Internet access, you'll need to open the Activation window. Go to Start and type in novaPDF Printer Manager. Once that window is opened, go to the Licensing tab and then click on the Activation button. From the activation window click on Deactivate. A message will appear asking if you want to deactivate that key. Click Yes. novaPDF will first try to deactivate the application online. If the online deactivation is not possible (i.e. your computer doesn't have access to the Internet), you will be asked to select another deactivation method: Send deactivation request by email or Save deactivation request file. Send deactivation request by email. Once you click on the option to deactviate by email, the default email client will open and an email with the manual deactivation request will be composed. Press send to email it to our de-activation server from a computer that has Internet access (i.e. you can save the email and send it from another computer). Save deactivation request file. 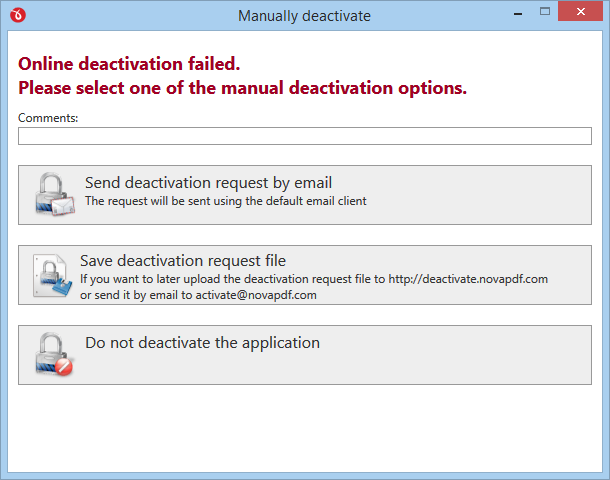 If you choose this option, you will be asked to save a file called Deactivate_request.xml That file needs to be uploaded to http://deactivate.novapdf.com/ and you must confirm you want to deactivate it. You cannot use a key on more computers than you are allowed to. If you try to activate a key on more computers than you are allowed to, you will be informed by that and you will be asked if you want to reset the activations for that key. If you send a reset activation request, all the existing activations for that license will be reset. This means that the license will be deactivated on all computers that used it. Press Yes and a webpage will be opened: Reset Activations Request - on that page you fill in the details and submit the reset activations form to complete the process.